If you're having a party and everyone's invited, the MondoMid is the shelter for you. A massive 10 x 10 ft | 3 x 3 m, this CUSTOM ORDER SHELTER is the grand-daddy of the Mid Series. It's so big, we couldn't even fit it in a photo… So we posted a photo of the SuperMid. Just look at that, then imagine it bigger! 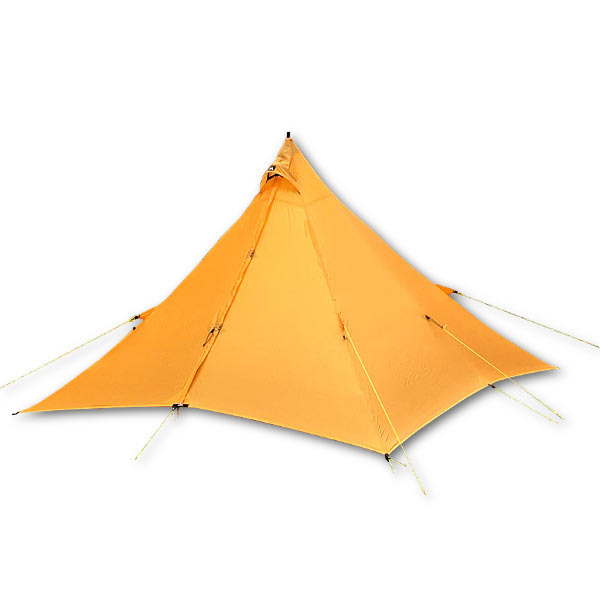 If you’re having a party and everyone’s invited, the MondoMid is the shelter for you. A massive 10 x 10 ft | 3 x 3 m, this CUSTOM ORDER SHELTER is the grand-daddy of the Mid Series. It’s so big, we couldn’t even fit it in a photo… So we posted a photo of the SuperMid. Just look at that, then imagine it bigger! 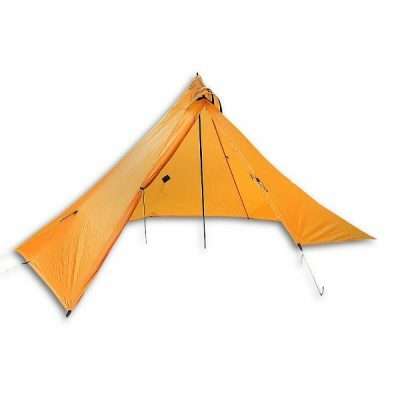 Despite it’s size, the MondoMid goes up as quickly as our other Mid Series tents, thanks to it’s single pole design! 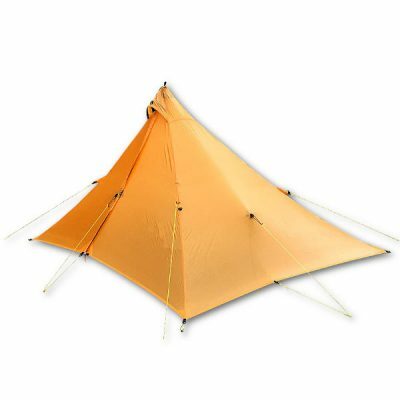 The MLD Exclusive panel design eliminates over 40% of seams vs. other MID designs.The side panels are joined near the peak by a much shorter horizontal seam. This is stronger and requires 40% fewer seams than traditional designs. No matter the size, we design all our products to be stronger and lighter! • Oversize peak vent can be closed: Pull out the wand and the vent Velcros tightly shut for hard wind and blowing rain and snow. • We like the ONE over oversize peak vent design best. Pitch the rear of the Mid into the wind to prevent rain and snow from blowing into the vent and creating a mini Venturi Effect to pull condensation out the oversize vent on the downwind side. • Plenty of room to stand up and side walls shed snow well. • Main seams are triple stitched (MLD Exclusive) and flat felled. • Apex reinforced with Dyneema X. • Both doors roll open and tie back. ** This is a custom order shelter. 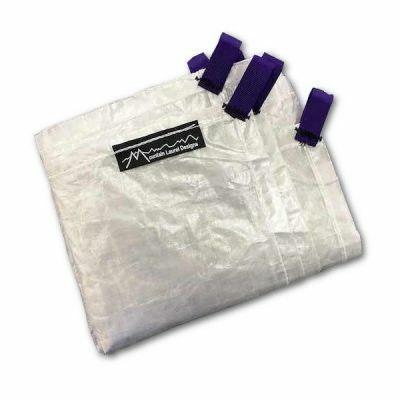 This is a 15 in | 38 cm long SilNylon skirts that is sewn to the bottom edges of the shelter for use in snow. This option cannot be combined with Perimeter Bug Net option. 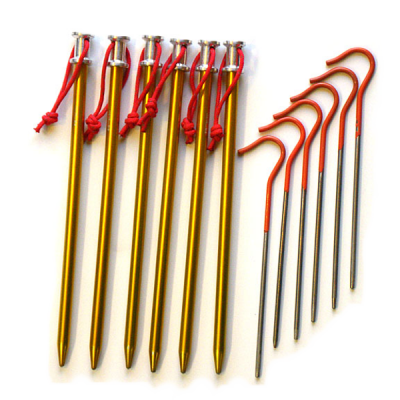 Add 16 Easton Aluminium Stakes to your purchase. Easton Aluminium Stakes are 8 in | 20 cm and each stake weighs 0.4 oz | 12 gm. • ONLY zip the zipper up OR down when the bottom buckle is fastened to relieve stress on the zipper. Clean and Lube the Zipper as needed. 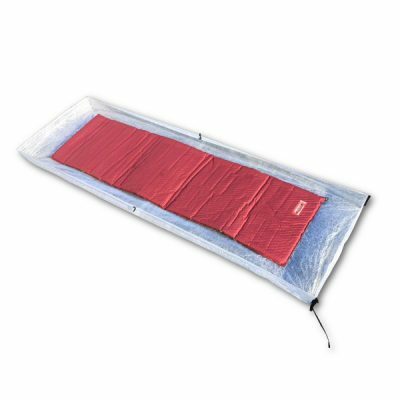 • Most of the time you will pitch this shelter a few inches off the ground for ventilation. • In high winds, the use of the side panel tie-outs is recommended. ALWAYS use a short bungee loop on side panel tie-outs and do not over tighten the side pulls, or you will get 75% + of the load on that one mid-panel tie-out. You want the load evenly distributed over all the tie-outs with the main force directed to the corner main seam tie-outs.